We all know how difficult it is to strike a balance between safe and secure and beautiful and aesthetically appealing. In South Africa, these are two very important concepts but they can be hard to achieve! Today at homify, we are going to help you out! 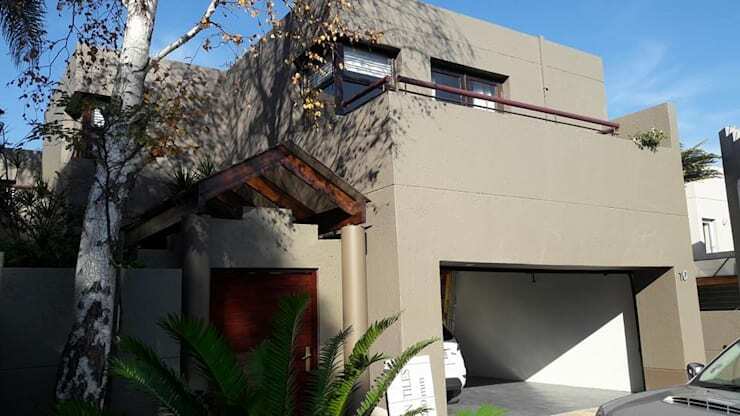 We've put together 7 South African facades that are beautiful and safe. Each of these designs is incredibly unique and beautiful as well as safe and homely, showing you how many different ways you can achieve this look and feel, with functionality playing a role. There is also nothing better than finding inspiration from local architecture, seeing just how many options exist. 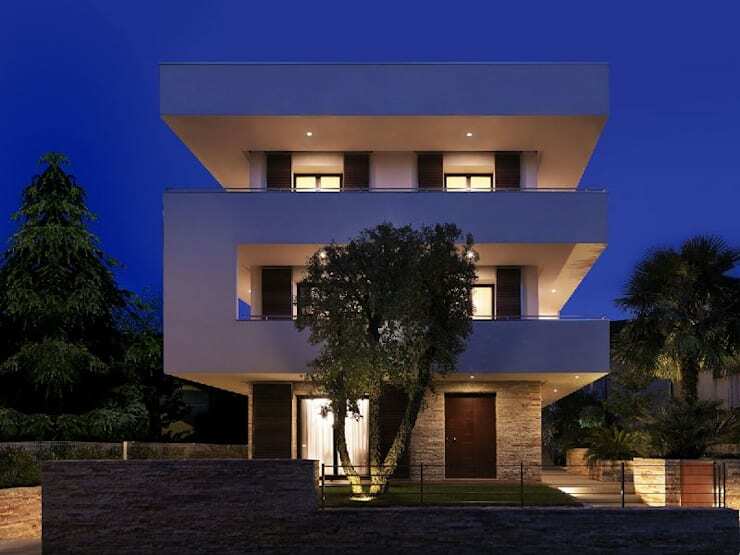 This modern home with its beige facade and wooden finishes features high walls, which keep the family safe and protected. Yet the high walls don't look overbearing or claustrophobic. In fact, they increase the height of the home and make it seem voluminous and spacious. The red roof tiles finish off the look and feel. 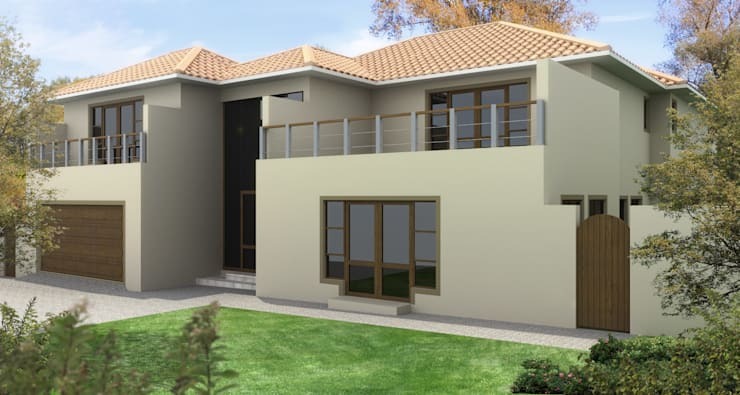 This design by architects Ndiweni Architecture shows how height can work in a design's favour. The layered effect creates a very safe and secure building that looks stunning too! Do you see how the stone facade works in harmony with the thick white walls and the wooden finishes, creating a building of varying textures and tones? 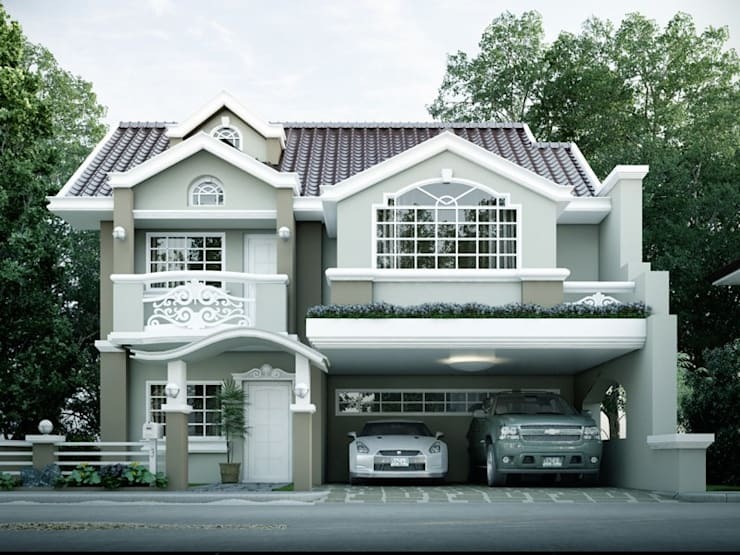 This facade features a double-garage, where cars can be parked safely out of the road. This ensures they don't get stolen or broken into! A double-garage is more than functional, however. It also keeps the home looking neat and sleek! This is another beautiful example of a safe home with a double garage, high walls and a solid front door, but the designers have added a classic twist. By incorporating curves, details and patterns throughout the facade, the home looks less daunting. Remember you don't want it to look like a prison! This home is sunk into a hilly property, with trees and walls surrounding it to keep it protected from prying eyes. This has allowed the designers to incorporate glass throughout the facade at the back of the home, ensuring that the home integrates flawlessly with the beautiful garden. 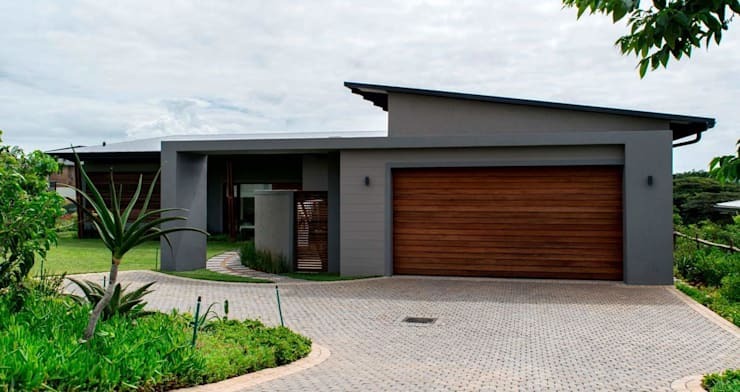 This grey facade is softened by the wooden garage door and wooden gate, making for a very warm, sophisticated and appealing look and feel. The designers have ensured that the walls are protective but do not block the beauty of the facade. 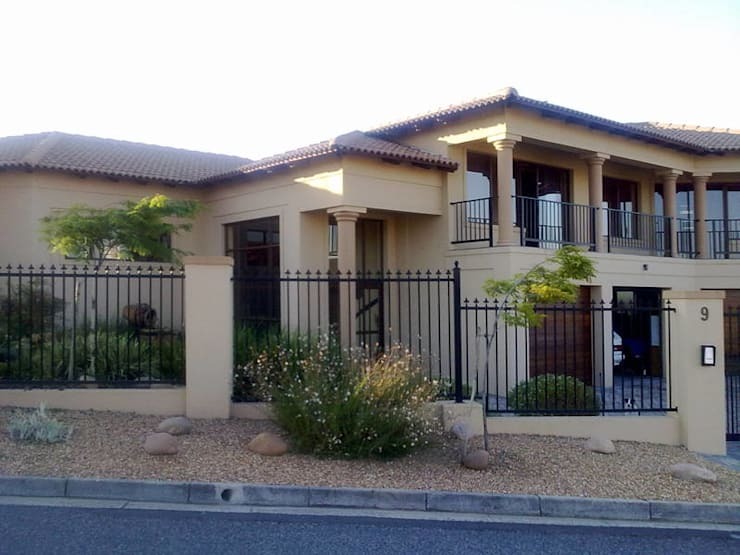 This gorgeous home features a black perimetre fence around it, which keeps the property protected. Yet it doesn't overwhelm the exterior look and feel or block the Tuscan design from view. If you've enjoyed this article, you'll love this article on the best garden privacy options. 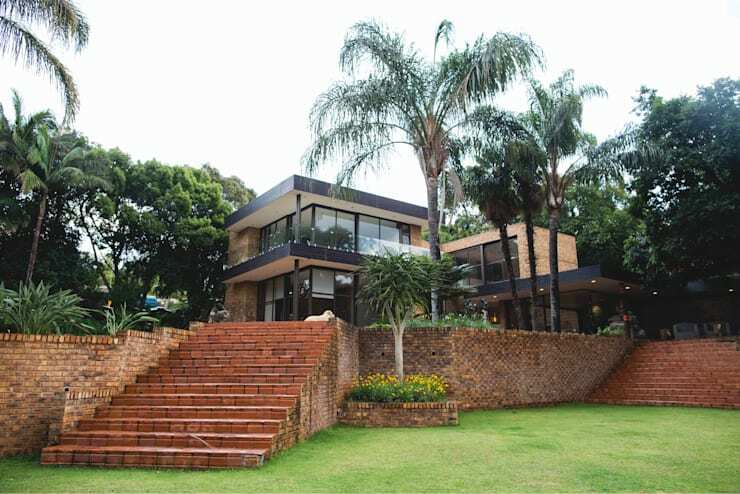 Which is your favourite South African facade?